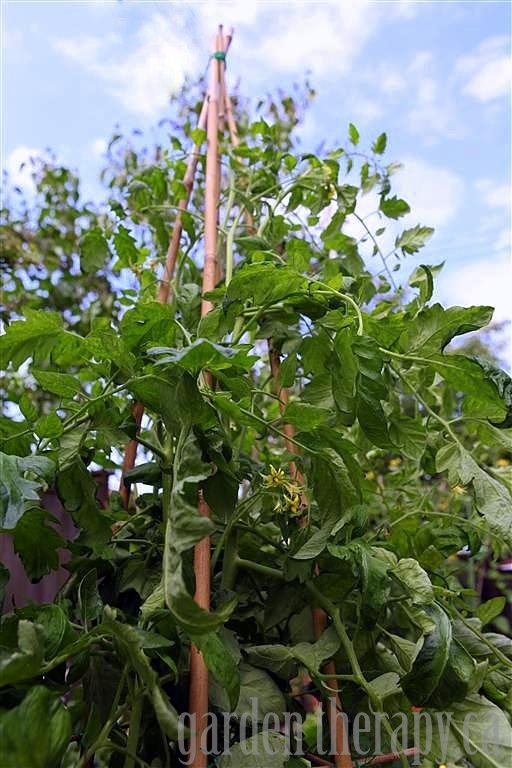 If you neglected to put a tomato cage around your plants when they were small, it’s not too late to wrangle out-of-control stems back into an orderly form. In fact, it’s a great time to get out there are support your plants. What better way to get some garden therapy for Weekend Project #43? 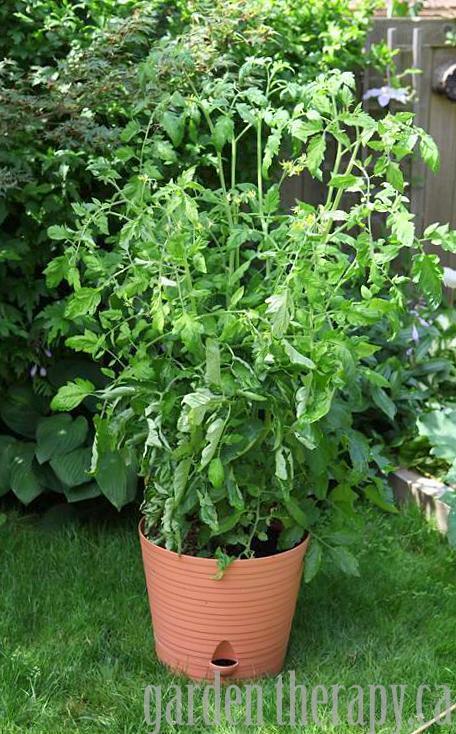 With the warm summer weather, your tomato plants could probably use a little love. 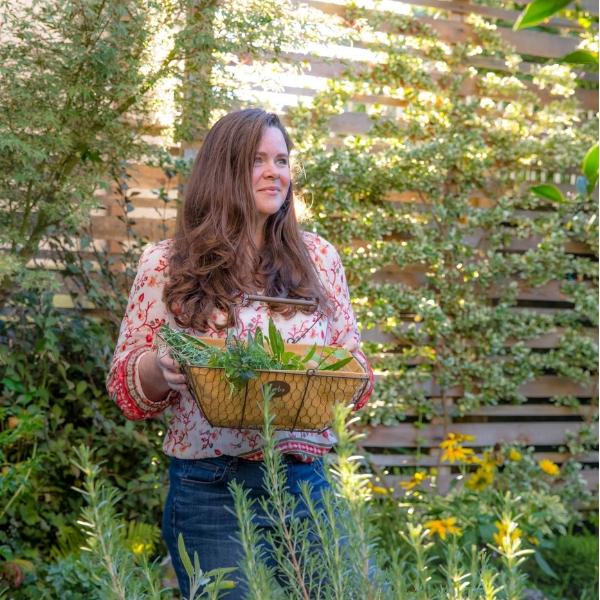 I usually grow mine in self-watering pots on the side of the garage where I have a wonderful trellis that allows me to tie the branches on as they grow and helps to support the fruit. This year the pots have been moved around a bit and, since they were doing so well, I decided to keep them there and sort out some form of cage or stake system to keep the plants from flopping. 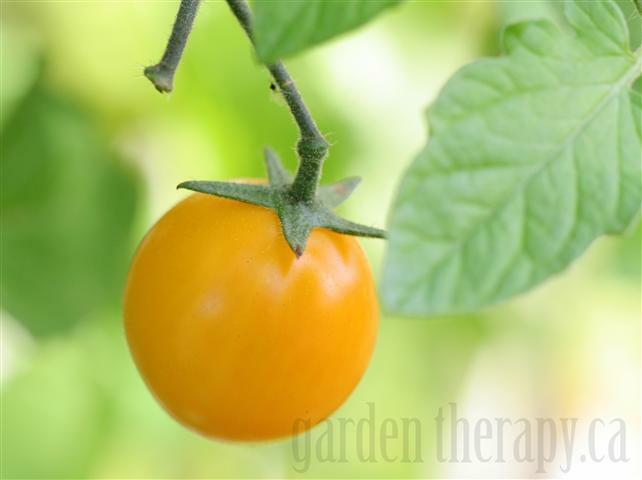 There are two different ways to support tomatoes based on their growing habit. Bush or determinate varieties do well with cages that support full, bushy growth that maximizes at a certain height. 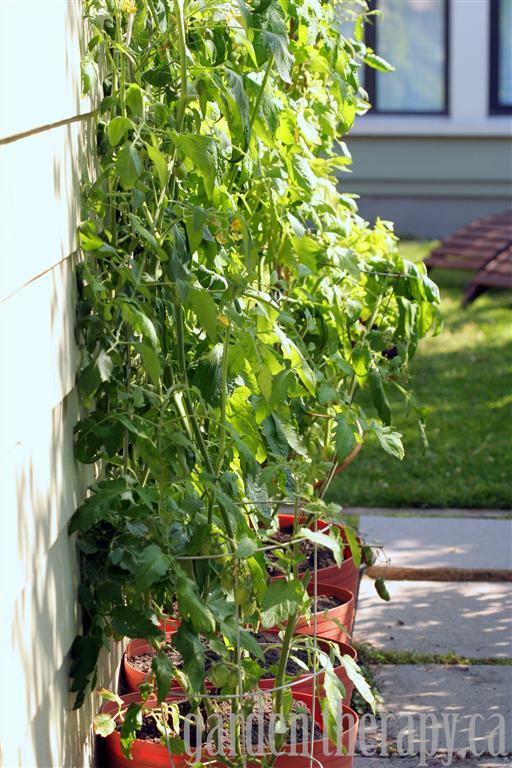 Vine or indeterminate varieties do well trained around a large stake and keeping the longer side branches trimmed as they grow up endlessly to the sun. 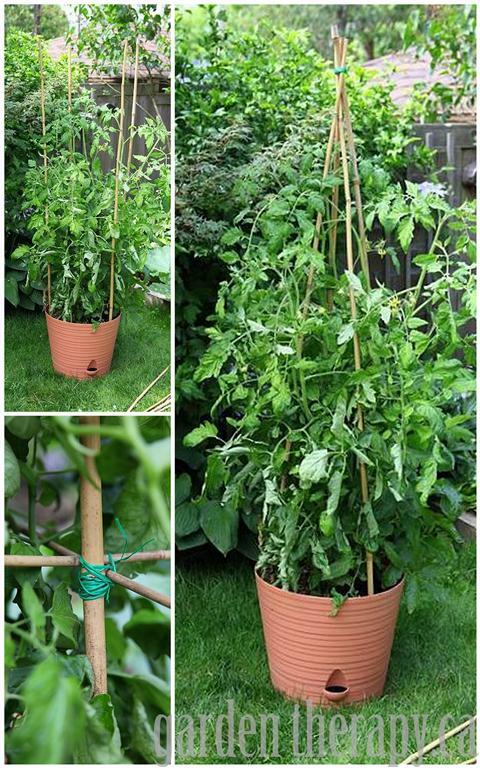 There are many types of supports available: curved metal stakes to train the stem, clips and hoops to support the heavy fruit, the most basic and common method of using a long stake set firmly into the soil at the base of the plant, plus many, many more. 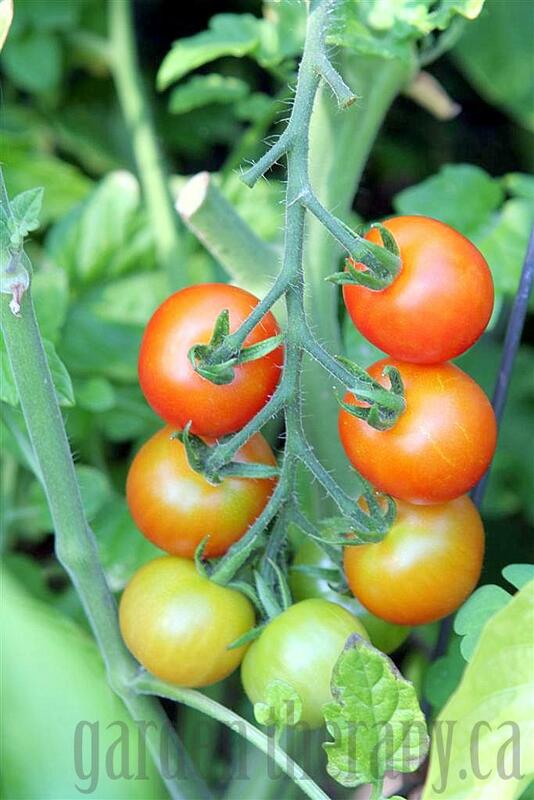 I choose tomato varieties that will produce fruit on smaller plants so they do well in containers. Even with indeterminates, I build a cage around to support a bushier growth and help to hold the ripening fruit. If I still wanted to use my tomato cages, I could have cut the rings with a bolt cutter and bent the wire at each cut to make hooks. I wish I had a bolt cutter. Oh to have a bolt cutter. With a little more searching I was able to find a solution with the tools I did have from this fab tutorial on the About.com Container Gardening page by Kerry Michaels. The video clearly explains how to build a cage from bamboo and garden wire. I had both of those just sitting in the shed waiting to become tomato cages. Here is what my cage project looked like. As these photos show, you use long bamboo stakes to create a tipi then start building the ladder rungs around all sides by twining the wire around the joints. It was quite a lengthy process to build so I will definitely be more organized and get the cages set up next year earlier in the season, but I actually find that this looks a heck of a lot cooler than the wire cages. 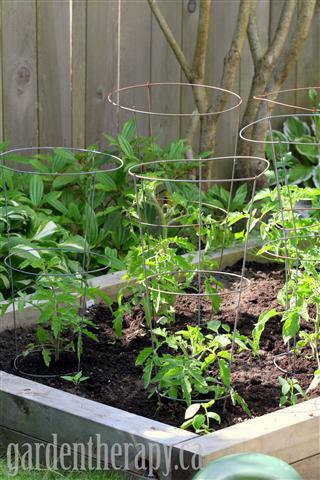 Another great tip I found in my search of the interweb for late season tomato plant wrangling is to use metal fencing and create your own cages with those handy dandy bolt cutters. 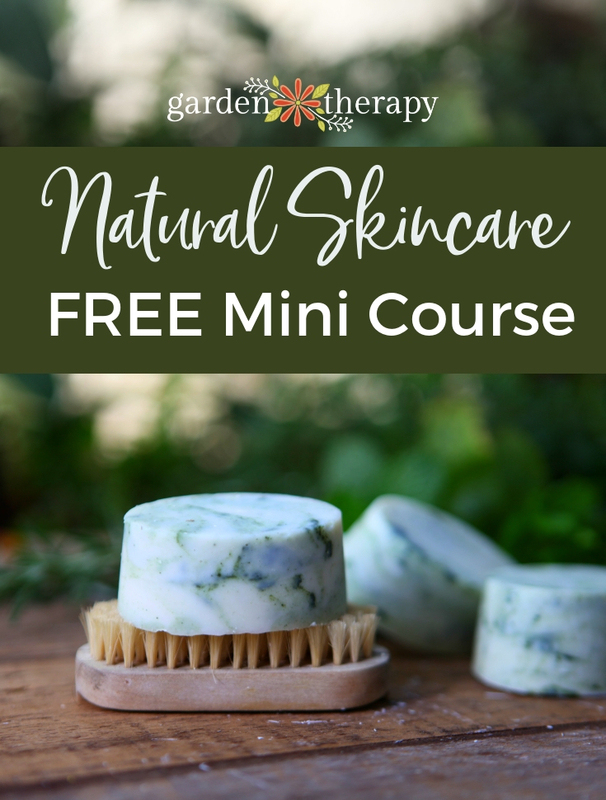 Now, go on, get outside and give those tomato plants some some pampering. They’ll pay you back very shortly. a free-to-play ‘fantasy shop simulation game featuring strong economic ties. There are a lot of games out there, but not all of them are good. Finally a message from super-star Clint Cruise: ‘Oooh yeah Get Cost-free Clash of Clans Diamonds shoo badaby dooo. Brioef but very precise information… Appreciate your sharingg this one.